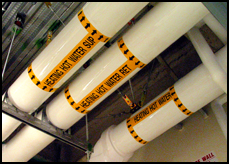 BG Labels & Tees adhesive PipeMarker line covers all of your pipelabeling needs. 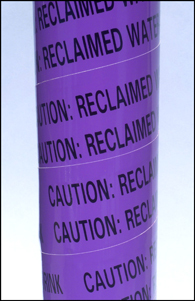 Our adhesive backed viynl labels are printed on premium high cast vinyl that is made to last. From our style 20sm, made for 0.25” pipes, to our style 1A, made for pipes with an outside diameter of over 10”, we have you covered. We also can create custom sized labels to meet your exacting needs and can help you decide what color scheme is correct. 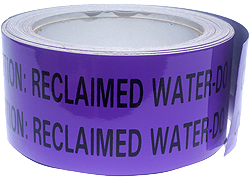 BG Labels & Tees also offers adhesive pipe markers in rolls of 30 yards. These rolls come in widths of 2 or 4 inches. 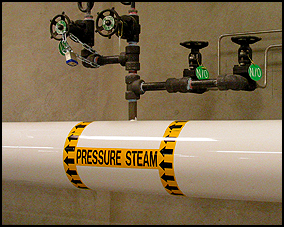 The rolls are offered in the same premium high cast vinyl as our individual pipe markers. Above: Installed Style 1A self adhesive markers with arrows. Download our ANSI complient size chart to help determine what style label you need.